You have moved to a new village populated by animals. 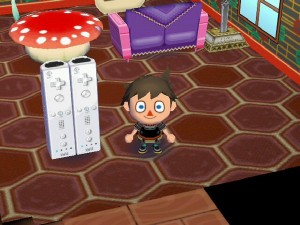 After being set up with a mortgage by shopkeeper Tom Nook, you have to collect Bells to pay him back, as well as collecting items to decorate your home. You can now travel to a new City area by bus where there are many more stores and characters to visit. You can also visit other towns using the Nintendo Wi-Fi Connection and take part in events in their town. 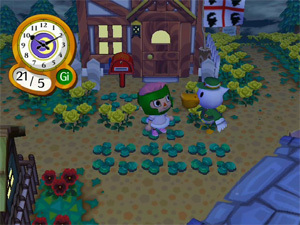 Animal Crossing: City Folk uses the Wii Speak accessory, allowing all players in a room to communicate with other players. Each time you shop at Tom Nook's store you earn points that can be traded in for rewards. The rewards are all items based on Nintendo games. Banana from the Mario Kart series. Triple Shells from the Mario Kart series. Yoshi's Egg from the Mario series. Bad Bro 'Stache (Wario's moustache) from the Mario series. Toad Hat from the Mario series. Peach's Parasol from the Mario series. Hero's Clothes from The Legend of Zelda series. Varia Suit from the Metroid series. Wario Hat from the Mario series. Hero's Cap from The Legend of Zelda series. Majora's Mask from The Legend of Zelda: Majora's Mask (N64). Samus Mask from the Metroid series. Midna's Mask from The Legend of Zelda: Twilight Princess (GCN/Wii). Kart from the Mario Kart series. Nintendo released special downloadable content available on specified dates. 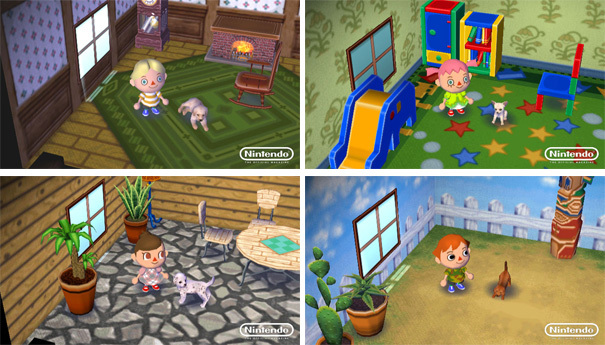 Many of the items available were released as promotions for other Nintendo releases. 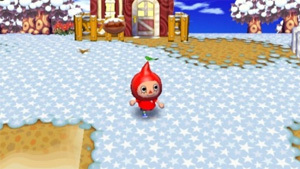 A wearable red mask with a leaf sticking out based on the Pikmin series. Released to coincide with the release of New Play Control: Pikmin. A seat design based on the Nintendo DSi. A white version was released in Europe and a black version released in the US. Released to coincide with the release of the Nintendo DSi. Wearable green boxing hat based on Little Mac's headgear from the Punch-Out!! series. Released to coincide with the release of Punch-Out!! (Wii). A model of Captain Olimar's rocketship from the Pikmin series. Models of a labrador, chihuahua, dachshund and a dalmatian from Nintendogs. A set of drawers shaped like a GameCube. Two giant Wii Remotes side-by-side. Released to celebrate the 4th anniversary of the release of the Wii. 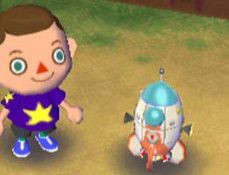 Several other items are based on objects or characters from other Nintendo games, and many appeared in earlier Animal Crossing games. Big Bro's Hat (Mario's hat) from the Mario series. Big Bro's Mustache (Mario's mustache) from the Mario series. Big Bro's Shirt (Mario's shirt) from the Mario series. Classic Mario Furniture based on sprites from Super Mario Bros..
SMB3 Paper with designs from Super Mario Bros. 3. Triforce from The Legend of Zelda series. Master Sword from The Legend of Zelda series. When you "use" it, it plays the Zelda "Get Item" fanfare. This line is taken from the merchants in The Legend of Zelda on the NES. "Turn somersaults! Jump up and down! Do a barrel roll! Do SOMETHING! 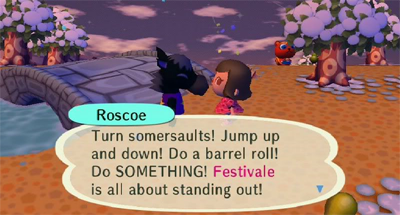 Festivale is all about standing out!" The phrase "Do a barrel roll!" is a line from Star Fox 64 that has been regularly parodied as an internet meme. During the bus trips while you're talking to Rover, Kapp'n can occasionally be heard whistling Kazumi Totaka's Song. 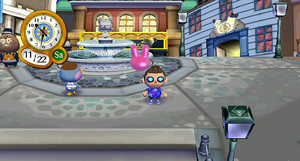 As in earlier games in the Animal Crossing series, Kazumi Totaka's Song also appears as "K.K. Song", requested from K.K. Slider. 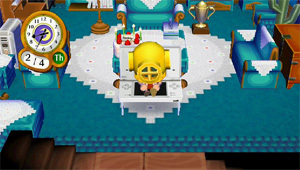 On the dashboard of Kapp'n's bus, you can see text written in Hylian, the language in The Legend of Zelda series.